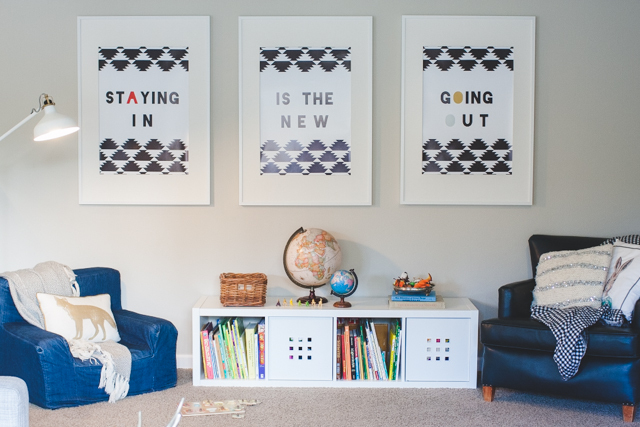 Making a home that allows my kids to play, create and have fun with friends while also keeping things stylish and welcoming for the taller humans in my life is a priority of mine that’s been a bit tricky. 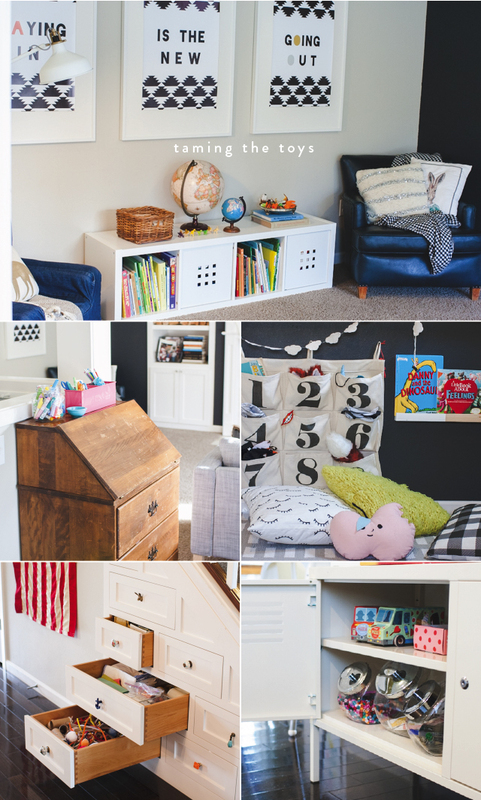 While we aren’t lacking on space necessarily, having 5 kids and no playroom has added an extra challenge and even though I lean a little more towards being kid-friendly over sophisticated (at least for this season in our lives) I thought I would share a few ways we keep the house from looking like we run a daycare. At least most days. Our family room has been the hardest to figure out, so we’ll start there! 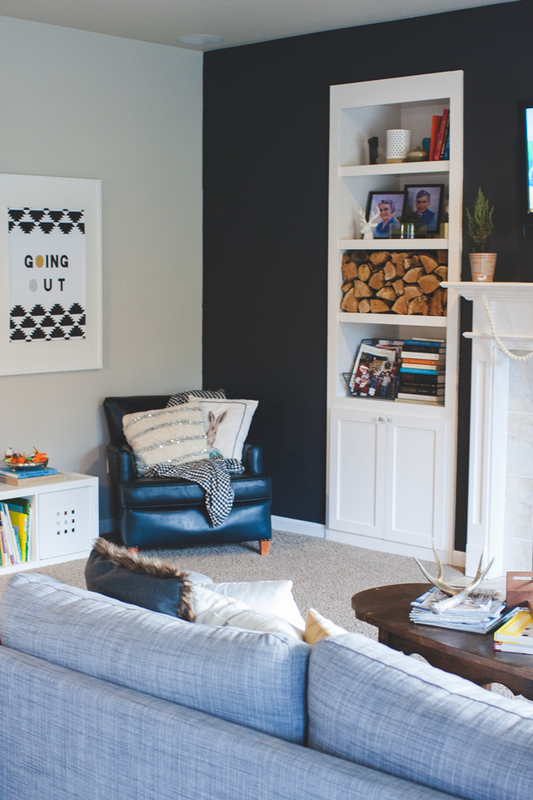 Everyone should feel welcome in this room so (for us) keeping things cozy, playful and casual is a must. For the little ones that means toys and an area to hangout so we added a space for them on the far wall of the family room — It’s hidden from view if you are standing in any other part of the downstairs which is nice. 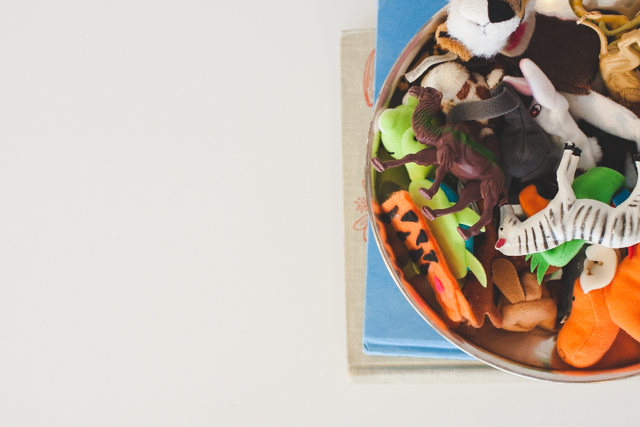 At the moment our toys could use a spring cleaning but for the most part I try to limit the type of toys that are down here to baby/toddler toys, a basket of wood blocks, finger puppets and plastic animals, and books. 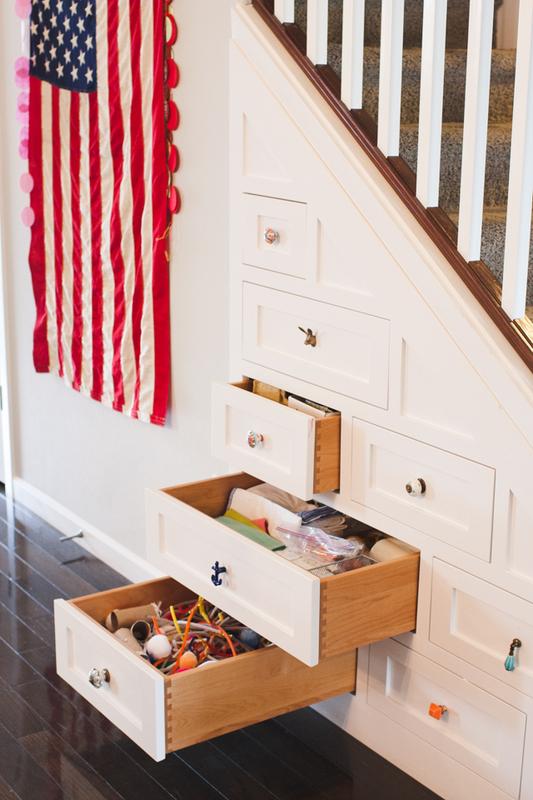 Legos, hot wheels and dress up do make an appearance every once in awhile in the family room but mostly stay upstairs in the kids’ rooms. Food, rough housing and climbing on the furniture is also mostly off limits in this space. Popcorn on movie nights being the main exception. 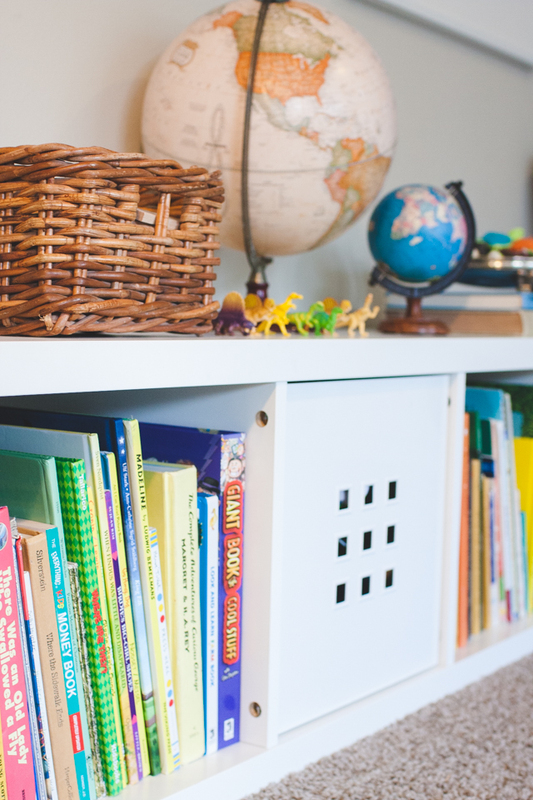 There are (of course) a few things I would like to change but for the most part I think adding a few sturdy decorations and pretty bowls or baskets helps incorporate the toys into the room. Cozy seating (like poufs), pillows and blankets are always appreciated by the little and big people and it all helps bring things together. 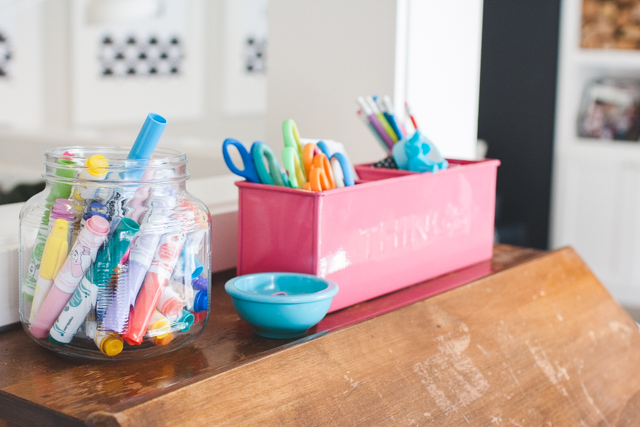 We have this little desk in our breakfast nook — that should be called the crafting, homework and after school snacks nook — where we keep coloring books and other crafty items as well as office supplies, batteries and other household stuff. 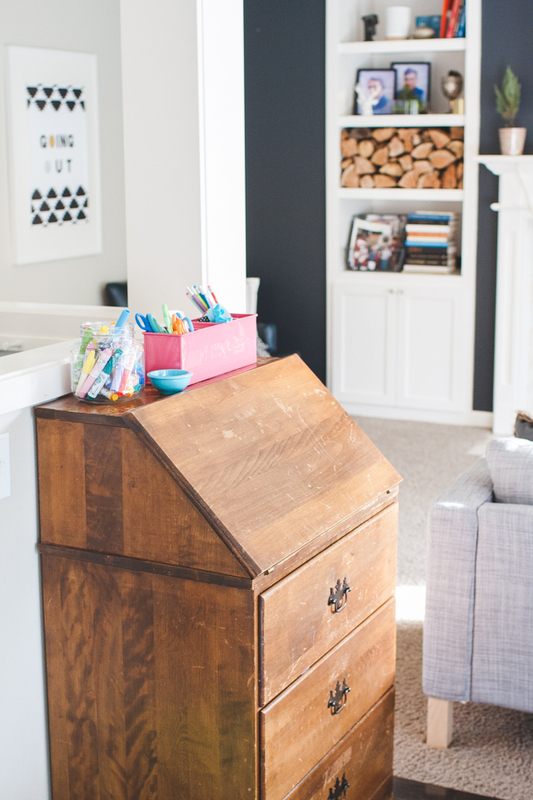 It’s nice to have these things tucked away but still easily accessible and now that the kids are older I also keep paper (index cards are always handy! ), scissors, glue sticks, pencils and markers out in plain sight. 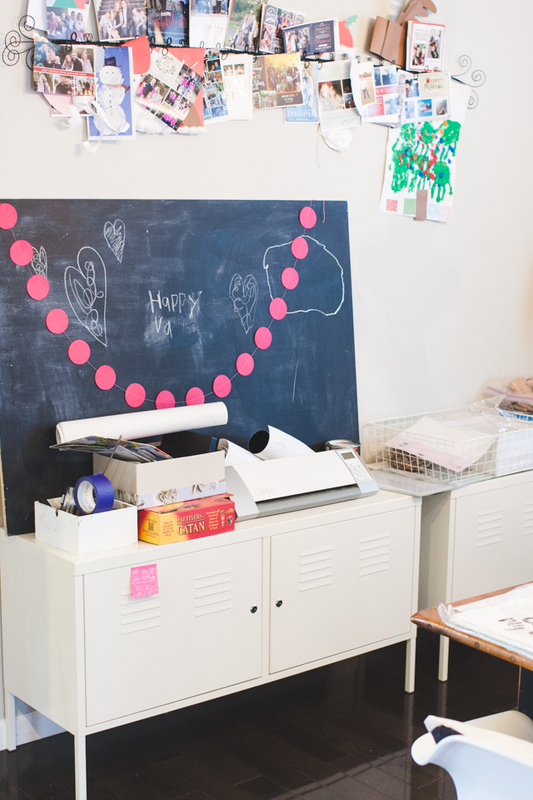 In our last (much smaller) home we used a generous sized drawer in the kitchen to hold coloring and school supplies which worked great too. Another set of drawers we use a lot for toys, crafts and other knick-knacks are the ones under our stairs. They are easily my favorite feature in our home so if you get a chance do something similar I highly recommend it! Kids have a lot of thinggggs. Since we don’t have a playroom to hold most or all of it I like to spread the love in different areas of the house. 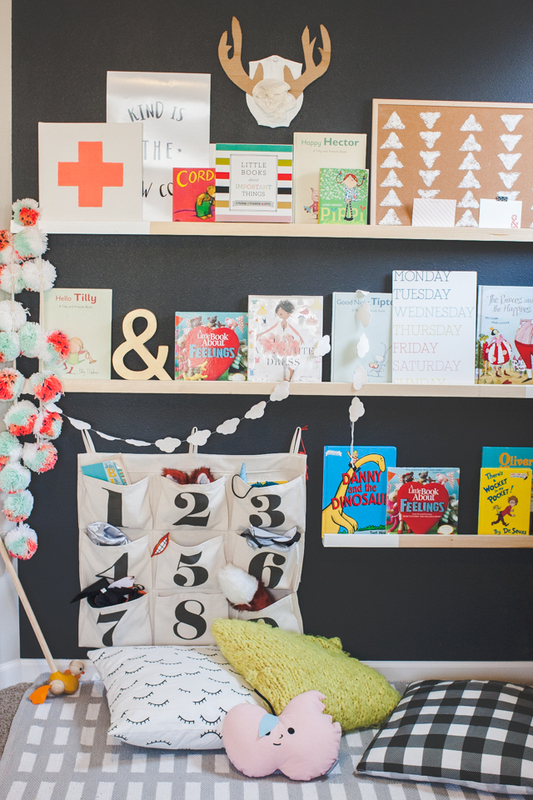 Such as this kid friendly wall in my office for books, more baby toys, felt masks and a giant checkers game. My office is roomy enough to accommodate and the new space is well loved but a small bin of books and a floor pillow would do the trick in a smaller space. 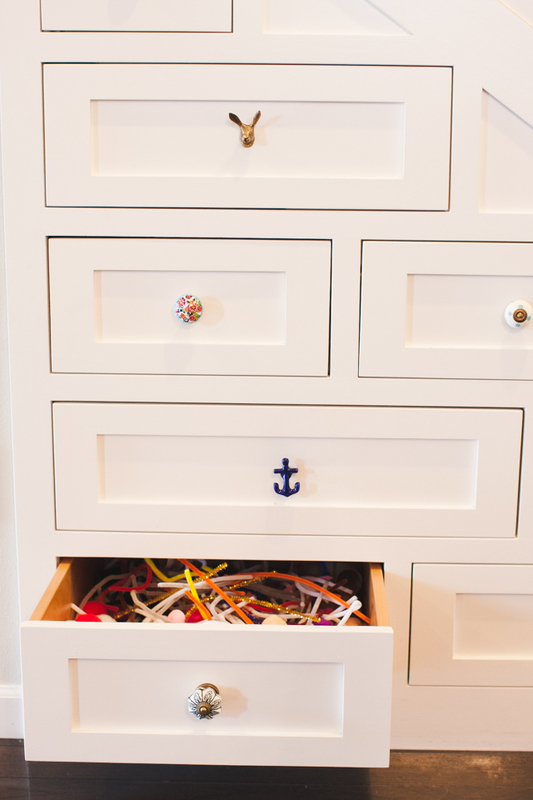 Last but not least are the lockers in the dining room where the puzzles, boardgames and (thanks to the locking doors) paints, glitter glue and other messy craft supplies that require permission before using, live. Games and puzzles are almost always played with at the dinning room table so this works out perfectly and makes clean up a cinch. 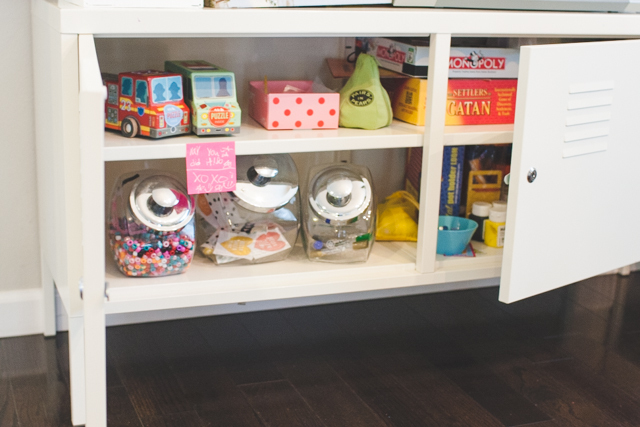 Another random area we’ve stored toys in the past is a basket of play kitchen items in the pantry. It was a fun arrangement and they got played with a ton but I was also cleaning (and tripping on) them up a lot so it only lasted a few months. I hope this was helpful, but enough about me! Let me know how you handle all the toys and kid stuff and don’t hesitate to ask questions. Stumbled onto this post after looking for kid toy storage ideas. Haven’t been reading blogs much for quite awhile and I forgot how adorable your blog is! You have such bright, fun, cool style. Can I ask where your blue couch is from? It is also good for ‘living with kids’? Super cute styling!